Solar BBQ cooking allows you to enjoy cooking outdoors without any issues of polluting the atmosphere through burning charcoal, wood or gas. Producing no smoke it also helps those with breathing difficulties and by using the sun to heat the food it incurs no long term running costs. By creating your own Solar BBQ you control what materials are used to construct it, which can help to make the BBQ as environmentally friendly as possible. 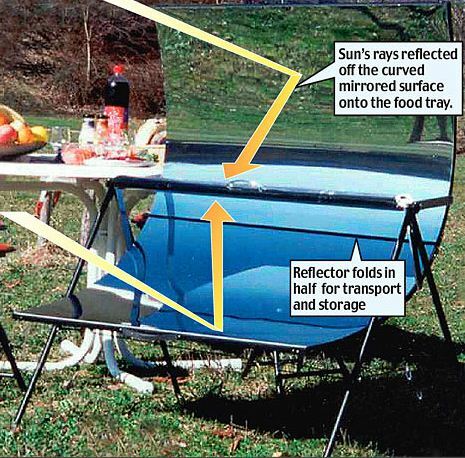 As with the Solar Oven, focusing sunlight can create perfect conditions for cooking food that produces no pollution. Most of the materials required to construct the BBQ can be picked up second hand and for some parts you can re-purpose otherwise disposed of items to help construct the BBQ. The design of the BBQ is quite basic but effective, you need a large reflective surface with a structure to hold a container of food over the focus point of the light. The focused light heats up the container the food is in which cooks the food inside. Cooking times would vary depending on the intensity of the sunlight and your BBQs ability to focus the light. The DIY guide suggests using a large golf umbrella to secure reflective materials to, anything from mirrors to unwanted CDs/DVDs to foil can be used and requires the use of a high temperature resistant silicon (as glue would melt) to fix the reflective material into place. A frame is then required to allow food to be place directly over the central point of the reflective material, items like wooden sawhorses can be used with metal bars attached and a grill between these to provide a cooking platform. By creating a solar BBQ yourself you help to reduce costs as it is down to you what materials you use to construct it. Often more expensive materials will provide a better effect (at least with the reflective surface) but there is the option to be able to hunt for parts to use, to recycle unwanted materials allowing them to be re-purposed, this both helps save you money and stop unwanted materials going to landfill.